On or since death officially accepted: 21st March 1918; age 37. Residence: 233, Woodbridge Road, Ipswich. 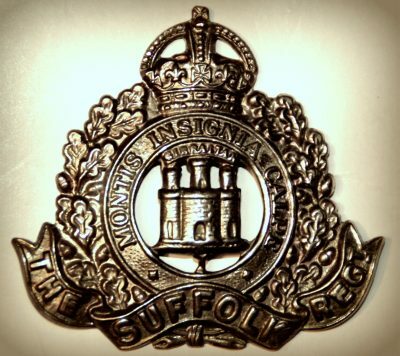 Relatives Notified & Address: Son of William & Susannah Crisp, of 2, Railway Cottages, Wherstead Road, Ipswich; husband of Rosa Jane Crisp (nee Brown), of 233, Woodbridge Road, Ipswich. 1881 Railways Buildings, Wherstead Road, Ipswich. Christopher was 1 month old and living with his parents & sisters. William Crisp, 35, an Iron Foundry Labourer, born Tattingstone, Suffolk. Susannah Crisp (nee Cocker), 39, born Colchester, Essex. Eleanor Crisp, 13, born Ipswich. Emily Elizabeth Crisp, 7, born Ipswich. Phoebe Jane Crisp, 5, born Ipswich. 1891 126, Wherstead Road, Ipswich. Christopher was 10 years old and living with his parents & sister. William, 45, a Foundry Labourer. 1901 152, Wherstead Road, Ipswich. Christopher was 20 years old, an Iron Moulder. He was living with his parents. William, 56, a Foundry Labourer. 1911 2, Railway Cottages, Wherstead Road, Ipswich. Christopher was 30 years, a Plate Layer. He was married and Head of the Household. Rosa, 32, a Tailoress – at home. Christopher’s mother, Susannah Crisp, died 1910, Ipswich. Hilda Ivy Crisp, born 1909, Ipswich.